Julian and Lea chose The Biltmore Ballrooms, one of the social and business epicenters of Atlanta, as the venue for their wedding celebration. The original handcrafted plaster ceilings, restored crystal chandeliers, Palladian windows and Tennessee marble floors made a truly spectacular backdrop for the wedding. Pretty Tulips did an amazing job coordinating various top notch vendors, including HairJuku Studios, Journeys Hair Concepts, Makeup by Gray, floral decorations by Andy Beach and Co. were absolutely AMAZING. The gorgeous pink flowers cover the table, the backdrop, and every square inch of the ceremony and the reception. The delicious catering by Bold Events keep everyone licking their lips, and maybe a finger or two. Rev. 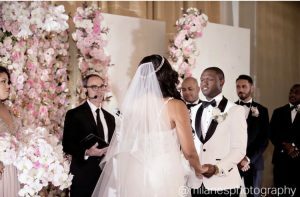 Scott Barber of Sensational Ceremonies worked with the happy couple to create a beautiful custom ceremony, rich in love and laughter. They used the Sensational Ceremonies ceremony planning kit to pick out every detail of their ceremony. The ceremony was a handcrafted celebration of the bride and groom’s unique stories, their differing religious backgrounds and the future they are building. The couple enjoyed the blend of humor with the sacred that made the ceremony both memorable and enjoyable. Along the way, it was discovered that the bride and the officiant and many of the invited guests shared the University of Alabama as their college alma mater. Upon request from the bride, Rev. Barber gladly included a hearty “Roll Tide!” during the ceremony, much to the crowd’s delight.